There are several "must see" sights around Bangkok. Every tour of the city will include these highlights. In reality, you could spend many days exploring all the city has to offer. For interesting and less frequented locales, check out the Hidden Treasures series of articles on the next page. Package tours for Bangkok and surrounding areas can be purchased in advance through our partner Viator. Most hotels will have tour desks offering similar tours. The advantage to purchasing in advance is that you can be sure of what you're getting and don't have to know whether or not your selected hotel has a tour desk. In reality, you don't really need a tour guide to see most of what Bangkok has to offer. These days, it's a fairly easy place to get around in using trains and boats which offer speedy and reliable service. My Bangkok Essentials ebook packages all the detailed information about the major sights (the ones listed below and many more) in a format compatible with just about any ereader or ebook app. The Grand Palace was established by the first king of the Chakri dynasty in the late eighteenth century. Following the common practice from the previous Ayuthaya kingdom, the palace was designed to include a royal temple. It is this temple, Wat Phra Kaeo, which is open to the public and not the royal residences. Although no longer used by the royal family as a residence, the royal apartments remain closed to the public. They are sometimes used to house visiting royalty from other countries. The Temple of the Emerald Buddha (Wat Phra Keo) is a sort of national cathedral, housing one of the country's most sacred objects. As such, entry is free to Thais but foreigners must pay an entry fee (400 Baht, or 10.39 USD). The temple is enclosed by a cloister-like gallery painted with scenes from the Ramakien, the Thai epic based on the Hindu Ramayana. A central raised platform has a gilded chedi, a copy of the Mondop from Wat Phra Buddhabat and another pavilion housing images of the Chakri kings. There's also a model of the temple of Angkor Wat. The largest building in the temple is the ubosot housing the statue of the Emerald Buddha. Note that no photography is allowed within the building. The Buddha image, carved from a large piece of jadeite, sits high up on an elaborate gilded alter. The walls of the chapel are painted with murals depicting scenes from the Buddha's life. Immediately south of the Grand Palace lies Wat Jetuphon, more commonly known as Wat Po. Its actually the oldest temple in Bangkok, having been established in the sixteenth century. It was extensively remodeled by the early Chakri kings who made it Bangkok's first center of public education. Many monuments salvaged from Ayuthaya were installed in Wat Po. What most visitors come to see is the huge Reclining Buddha. This gilded statue is nearly 150 feet long and 50 feet tall. Its size is hard to appreciate, since the building housing the Buddha is only a little bigger than the statue. Of special note are the feet of the statue, the soles of which are inlaid with the 108 auspicious signs. There is much more of interest in the temple for those willing to spend a little more time. Next to the chapel housing the Reclining Buddha are four intricate pagodas dedicated to the first four kings of th Chakri dynasty. The main bot has marble panels built into the base which were taken from the ruins of Ayuthaya. The panels depict scenes from the Ramakien and rubbings from them have been reproduced many times. Wat Po is also popularly known as the main center for the study of Thai massage. You can get a massage from one of the temple's trainees, or learn the art yourself. In fact, the temple tries to retain and transfer knowledge about the entire range of Thai traditional medicine. Wat Arun is on the east bank of the Chaophraya River. The temple pre-dates the founding of Bangkok as the capital. You can reach the temple by ferry from the Tha Thien pier a short walk from Wat Po. However, our suggestion is that you rent a long tailed boat from the pier at River City for a two hour tour of the canals, royal barge museum and Wat Arun. A tour of the canals can give you a flavor for what life in Bangkok was like before most of the canals were filled in. Wat Arun means Temple of the Dawn and it is at its most spectacular early in the morning when it gets both direct sun and light reflected off the river. The spectacular five spired prang is a feature not found on anything like this scale in any other Bangkok temple. The pagoda is encrusted with bits of porcelain, all of which has been cleaned and renewed in recent years so that the towers are more glittering than they ever have been. Although the temple is older than Bangkok, the prang was started by king Rama II early in the nineteenth century. The temple is the site of several festivals throughout the tourist season from December to March. These include an impressive sound and light show held in the evenings. For a complete list of all the major temples of interest, please see our Bangkok Temples page. 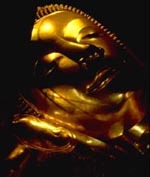 Bangkok also has more than 100 museums and art galleries. My directory of the museums of interest to travelers may spark some more ideas about what to see.